THIS IS A DEDICATED CONCERT BUS SERVICE, THE BUS WILL DROP ALL CUSTOMERS TO THE COACH PARKING IN MARLAY PARK AND PICK UP FROM THE SAME LOCATION 45 MINUTES AFTER THE EVENT FINISHES. 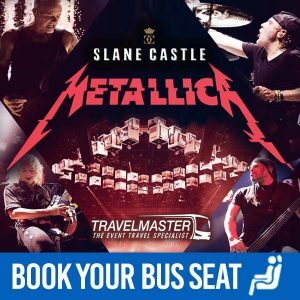 TravelMaster offers individual BUS seats to all major concerts and festivals in Ireland. Directly – we drop you outside and pick you up directly outside the concert, no walking, no queuing for Luas or any other transport such as taxis or connecting buses. Safely – We wait for you (up to a certain point of course 😉 and have your contact details on our system in case we need to contact you.